C.K dextro VDE Screwdriver Range – Making tough jobs easier! Continually striving to ensure its product offering is innovative and fresh, Carl Kammerling International offers a fantastic range of screwdrivers and has developed its most comprehensive range yet. Regularly working with tradesmen also gives leading brand C.K valuable insight into what works best, enabling constant innovation, as well as products that can be relied upon to do the job quickly and effectively. Core to its product offering are the C.K dextroVDE screwdrivers, a range of screwdrivers specifically designed for electricians, which feature an ergonomically shaped handle for increased comfort, control and safety in use and long-lasting, premium quality, Molybdenum-Vanadium-Steel blades for exceptional strength and durability. 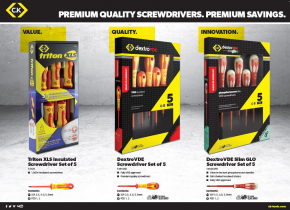 At the forefront of this range is the innovative dextroVDE Slim Glo screwdriver set. o Perfect for Electricians working in domestic, commercial and Industrial environments, these clever glow in the dark phosphorescent screwdrivers aid visibility in low light conditions, so you need never lose your screwdriver again, which can be both costly and time consuming. o Their Slim shafts also allow easy access to recessed screws and fixings without the need to remove insulation or compromise safety. The C.K dextroVDE slim glo set, along with the rest of the dextro screwdriver set range, have recently been relaunched in new and improved packaging, moving away from plastic cases to more easily recycled card, making them far more environmentally friendly. The eye-catching sets have been designed to aid self-selection – offering clear differentiation between the wide range of sets available - so consumers can easily find the set right for them. The 5 piece C.K dextroVDE Slim glo set, standard 5 piece C.K dextroVDE set and the C.K TritonXLS insulated 5 piece set are available as a fantastic bundle deal in our Fusion Trade Promotion – running 1 February to 21 June 2019. The selection offers, Innovation, Quality and Value – enabling all end users to find exactly what they are looking for and ensuring retailers never lose a sale. Supporting retailers not only with a fantastic deal, Carl Kammerling International are offering an eye- catching counter mat to drive sales in store and drive wider awareness through a packed activity plan of social media, advertising and PR.